In January, 2011, during my birthday, I had explicit divine leading, to recover failed and struggling marriages through targeted prayers and counseling. The emphasis was to help wives (through on-point, targeted prayers) dislodge the evil spirits that influence (and oppress) husbands into immorality, cheating and divorce, so as to reconcile, recover and refresh marriages of Christians. Christian marriages are supposed to be sweet, glorious and peaceful for life, a model for the world. So, we promptly put a structure together and started by asking God to send the people He would have us pray with or counsel. We also asked Him to confirm His Word and mandate on our Ministry by changing lives and marriages when we prayed. A couple of weeks later, hurting wives from across the world contacted us seeking more prayers for the change of their cheating husbands, and help for their marriages. Over these years, by God’s leading and grace, through targeted prayers, we have assisted hundreds of wives (and in a few cases, men!) 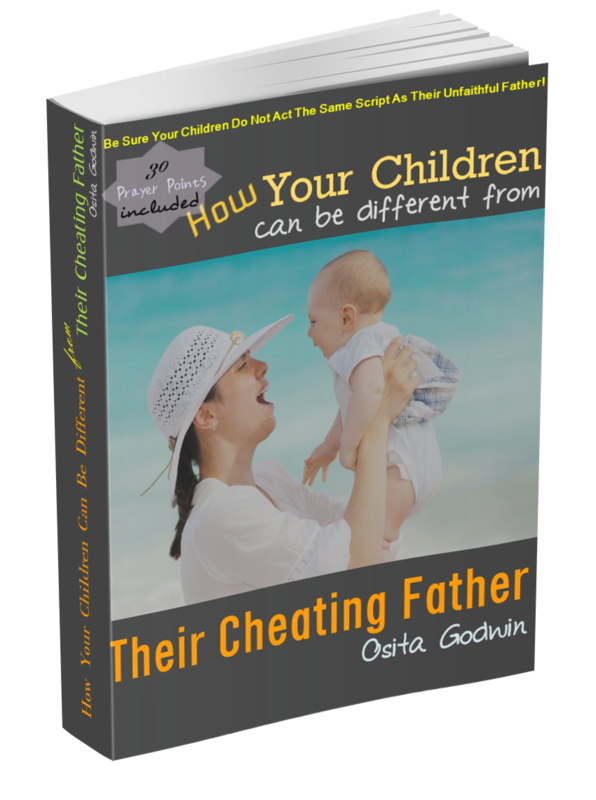 to recover and turnaround their cheating and lying spouses, thereby restoring their families. We usually function optimally as online prayer partners and counselors. We will like to add that we have had several heart-warming successes, from diverse countries, praying in the area of this divine assignment. My name is Osita Godwin-Onuoha. I’m a minister of the gospel of Jesus Christ, my Lord and personal Savior. By the privilege of God, I founded this Prayer Partners Ministry. Our website is registered and hosted in Canada, but the Ministry operates from Nigeria. Who I Can Help Most, And Who I Cannot Help. My assignment, for now, is to guide and pray with married born again Christians, who believe in the power of prayer for the change of their unfaithful spouses and restoration of their marriages. Well, don’t let that scare you if you have made several sinful choices in the past, or not a Christian yet. I can guide you to Christian faith, and victorious life, with some simple but powerful prayers that would transform you to the group that I pray with. So, the very essential qualification is to believe in prayer power, we'll work the rest out. Let me make plain the typical people this Ministry are to serve and get results for. This is to make it easy for you to know where you have come, and for me to also know if we are on the same page. Married born again Christians, who answer our questions completely and honestly. Who also are willing to follow the prayer guidelines strictly and persistently. Who send updates to me regularly about the state of things in their matter. Who do not mix up Christian prayers with lawsuits, physical confrontations, hate communication of any kind, monitoring, spying or surveillance of their spouse. Just want someone to pray for them while they wait and see. Already have their own prayers, or methods, and won’t respect our prayer direction and partnership. Who have their minds made up to end their marriages. Who give false account of their persons, status or circumstances. Cheating, adultery, unfaithfulness, infidelity are inherently spiritual because they are sponsored by evil spirits to frustrate and destroy marriages so as to fulfill the ministry of their master in 1 Timothy 4: 1; Mark 5: 13; John 10: 10. 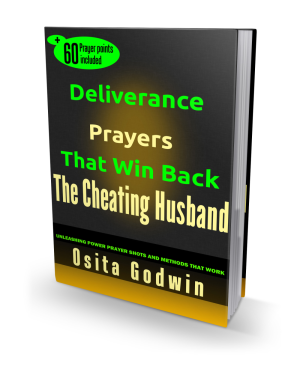 I believe spiritual wickedness can only bow to higher spiritual authority (Proverbs 27:19, 1 Corinthians 2: 10, Luke 11:22), so God-approved prayers carry matchless spiritual and physical authority to recover and re-establish any unfaithful spouse. I believe that divorce do not end a marriage, not even with the assent of both spouses, but a temporary setback or dislocation which can be corrected by targeted prayers. Mark 10: 9; Matthew 19: 6; Malachi 2: 16; Ecclesiastes 3:14. I believe that our prayers changes the person praying first. For instance, prayer power changes the wife of a cheating husband first before the power reaches the adulterous husband. 1 Timothy 4: 16. I believe that at the end of faithful prayers, every participating unclean spirit will be dismissed, every immoral soul tie annulled, every illicit affair broken and the cheater comes home, a new person, to a refreshed marriage. Isaiah 49: 25; Luke 11:22. I believe the spirit of lust, adultery, infidelity, lying, abuse, divorce is often a generational transfer from parents, which can only be terminated by targeted deliverance prayers. Matthew 13:25; Luke 22:3. I believe our prayers are answered when God allows it, so we pray until our prayer points are answered. Habakkuk 2: 1-3; Luke 18:1-7. I believe that there are right things to do to make marriage thrive other than prayers, but prayers entreat God to reveal those things. Matthew 7: 24-25; I Corinthians 2: 10. What You Can Expect From Me. We have a process where I intercede for new subscribers to Help Me In Prayer! If I’m unable to pray through during intercession, I politely decline prayer partnership with the person. If I get the go-ahead, I send her my start-off individualized prayer mail. So from the time I send that first mail with the prayer points, I’m committed to pray with the person until her desires are granted, except she gives up the pursuit. More, I want to guarantee that all the information you send are under my personal care and custody. My associates do not have access to them forever. I do not share them, even if you want me to, and I destroy them when we are through or at certain intervals. If at anytime you ever see your information in the identifiable form you sent it to me in some other place, it will not be me who shared it. I want to assure you that you will get the best, sincere, responsible and prompt counsel, you could call it advice, from me until you get what we pray for. I prefer use of the email because I can check it any time I need to, and I can always keep track of your needs to pray. However, sometimes, I do take phone calls or Whatsapp chats (on my special Whatsapp line only) when you want to draw my attention to an urgent matter. I like to pray over every correspondence and get an answer from God before I reply you. This does not a day, except when I’m on a prayer retreat, which is fairly often. I will pray for, and with, you relentlessly and passionately until you see your results come to you. I will never refer you to another man or Ministry for the prayers you sent to me. Any such direction is not from me, so ignore it. I may need your donations or financial support regularly but it is not mandatory, just as the spirit leads you. This is scriptural and in order. I may also recommend certain books for you which you may pay a nominal amount to get. The amount you pay is not for our upkeep here but just to cover webpage admin and delivery costs. What’s Your Contribution to the This Enormous Project? You don’t have to oblige me with your information or pictures, but if you must send them, I expect you to be truthful and detailed about the information you send. Honest information are like correct diagnosis of an illness, if the diagnosis is correct, the cure is easier. I’m busy here, I’m not amused by false information or fiction. We are concerned about the life and destinies of generations here, and we will not play pranks with serious things like marriages. I also expect you to read (I mean study) the materials I take so much time to write, whether as articles, newsletter or eBooks. Some of my books are given free, others are paid for. The paid ones are very cheap because they are heavily discounted. Our aim for the eBooks is to keep all instructions in one place for easy accessibility and reference, not to make money off you. The cost is to offset bills incurred in the process of preparing and delivering them to you. I do not charge you for the prayers I give you, or pray with you. However, the Ministry pays bills with God’s provisions through many of you who appreciate this work and want to sow seeds in the good land. So, I will appreciate if you consider to support us financially, regularly. I would never refer you to a spiritualist, spell caster, ‘prophet’ or any of such. They are tricksters and demonic agents and I have no relationship with them forever. In fact I’m against them as my God is against them. If you see any suggestion or hint that I’m asking you to patronize any of these people, ignore it. That message CANNOT come from me. In the past they sought to post spurious reports through comments in our website but our system blocked them. They even made attempts to impersonate me and send mails to my subscribers. Our system filtered them out too. Final word, don’t receive them. They will bring in more deadly spirits into your life to worsen your case, and get you to part with your money for nothing. When in doubt, write me. To contact me, please write me with the email already supplied to you or you could contact me here. I expect to be praying with you soon… I expect to see those prayers fulfilled soon in Jesus Name.